The failure to address the past is placing huge pressure on the criminal justice system, is a constant source of tension on political relationships, and is undermining efforts to build reconciliation within and between communities. In short, the past needs to be addressed and the Stormont House Agreement (SHA) legacy mechanisms discussed in the attached report are realistically the last holist effort that is likely to be made towards that end. To quote one veteran victims’ advocate who spoke at one of our recent consultation events, the Northern Ireland (Stormont House Agreement) Bill represents ‘the last chance saloon’ for many victims and their families. If this overarching effort is not delivered upon, victims and survivors will have been cruelly failed again. Such an outcome would be unconscionable and a moral blight on our politics. The Northern Ireland Office consultation that was launched in May 2018 provides detail on the proposed legislation designed to enact the series of mechanisms that were included in the Stormont House Agreement of December 2014. That Agreement was itself the culmination of lengthy negotiations by the five largest Northern Ireland political parties and the British and Irish governments. It retains many of the key features of preceding attempts to deal with the past. Although it is far from perfect, it represents what we believe to be the best possible opportunity to finally address the past. 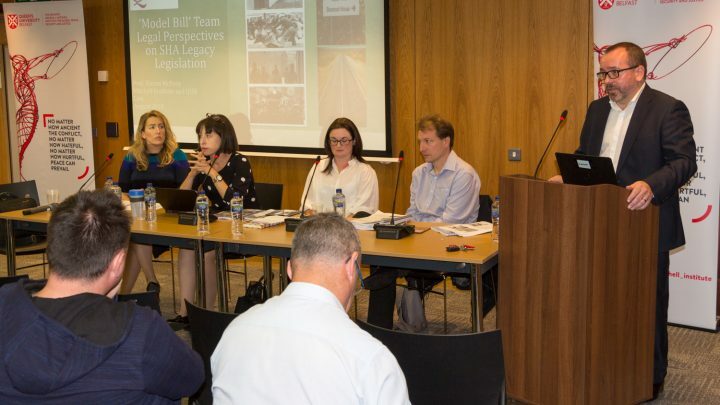 Shortly after the launch of the NIO public consultation five members of the original Model Bill team set about preparing this detailed response to these documents. This group offered a preliminary response to the NIO documents at a seminar held at QUB on 16 May 2018. At this event (attended by the NIO legacy team) some key concerns and potential ‘sticking points’ were identified. In the weeks that followed the team set about addressing those challenges and developed a more detailed response. We have tried to be as constructive as possible – highlighting strengths and points that we welcome. For each weakness that we identify (breaches of human rights standards, elements that run contrary to the Stormont House Agreement, or proposals that we believe to be unworkable) we endeavour to offer a remedy. the net result would be a significant advance on the prevailing fragmentary, under-resourced, and piecemeal approach to the past. The format of this report is as follows. We begin with a comprehensive Executive Summary that summarises the strengths and weaknesses in each of the mechanisms and sets out our key recommendations. We then address some crosscutting challenges that underscore the entire legacy process. These include issues that we believe ought to be included in the Stormont House Agreement Bill (a pension for the severely injured) and those that should not (a statute of limitations for former members of the security forces). Given its central importance to public confidence in the SHA mechanisms as a whole, we also offer some very clear recommendations on the issue of information redaction on the grounds of national security. In the main body of the report, we deal in turn with the Historical Investigations Unit, the Independent Commission on Information Retrieval, the Oral History Archive, and the Implementation and Reconciliation Group. We include in an Appendix our proposed model for dealing with information redaction in light of national security concerns that was published in 2017, elements of which are summarised in the main text. This public consultation is a vitally important element of the legacy process. However, it is also important thereafter that all concerned remain vigilant as the legislation passes through the Houses of Parliament, as the mechanisms are established, and as they commence their work. In the aftermath of this consultation, we will continue to do what we can to help ensure that the legislation that transpires is human rights compliant and likely to deliver for victims and survivors. We remain open to providing briefings and advice to any interested parties and encourage you to get in touch if there are questions with which you think we may be able to assist. We hope that you will find this report helpful and encourage you to disseminate it amongst your networks. For the full range of documents see Northern Ireland Office, ‘Open Consultation, Addressing the Legacy of Northern Ireland’s Past’ (11 May 2018) https://www.gov.uk/government/consultations/addressing-the-legacy-of-northern-irelands-past accessed 12 August 2018.